"University of Nevada" redirects here. For the other university in Nevada, see University of Nevada, Las Vegas. The University of Nevada, Reno (also referred to as Nevada, the University of Nevada, or UNR) is a public research university located in Reno, Nevada. 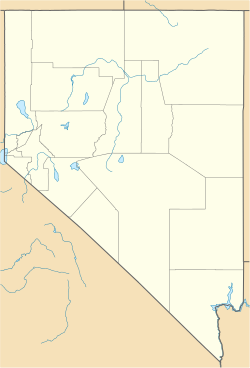 Founded October 12, 1874, Nevada is the sole land grant institution for the state of Nevada. According to the Carnegie Classification of Institutions of Higher Education, the University of Nevada is a research university with very high research activity (R1) as of December 2018. The campus is home to the large-scale structures laboratory in the College of Engineering, which has put Nevada researchers at the forefront nationally in a wide range of civil engineering, earthquake and large-scale structures testing and modeling. The Nevada Terawatt Facility, located on a satellite campus of the university, includes a terawatt-level Z-pinch machine and terawatt-class high-intensity laser system – one of the most powerful such lasers on any college campus in the country. It is home to the School of Medicine, with campuses in both of Nevada's major urban centers, Las Vegas and Reno, and a health network that extends to much of rural Nevada. The faculty are considered worldwide and national leaders in diverse areas such as environmental literature, journalism, Basque studies, and social sciences such as psychology. The school includes 16 clinical departments and five nationally recognized basic science departments. It is also home to the School of Journalism, which has produced six Pulitzer Prize winners. The Nevada State Constitution established the State University of Nevada in Elko, Nevada, on October 12, 1874. In 1881, it became Nevada State University. In 1885, the Nevada State University moved from Elko to Reno. 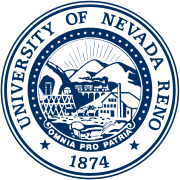 In 1906, it was renamed the University of Nevada and finally, University of Nevada, Reno in 1969 soon after University of Nevada, Las Vegas was granted full autonomy. The university was ranked tied for 197th among national universities by U.S. News & World Report in 2017, and 445th by Forbes out of the 660 best private and public colleges and universities in the U.S. Within the College of Business at the University of Nevada, the part-time MBA program was ranked 24th in the United States in 2014 by Bloomberg Businessweek. The University of Nevada, Reno is the flagship institution of Nevada. The campus is located just north of downtown Reno overlooking Truckee Meadows and the downtown casinos. Lincoln Hall (all-male residence) and Manzanita Hall (all-female residence) were both opened in 1896. While Lincoln was under construction, boys were housed in the building which had previously held the now-defunct Bishop Whitaker's School for Girls, which had shuttered in 1894. The Quad is located in the southern part of the campus, surrounded by Morrill Hall and the Mackay School of Mines. This quadrangle is modeled after Thomas Jefferson's at the University of Virginia. The northern end of the Quad contains a statue of John William Mackay (namesake of Nevada's Mackay School of Mines, later renamed the Mackay School of Earth Sciences and Engineering), created by Mount Rushmore designer Gutzon Borglum. The Quad and the original campus buildings surrounding it have a listing on the National Register of Historic Places. The football team plays at Mackay Stadium, The modern Mackay Stadium was completed in 1966 with a seating capacity of 7,500. The facility has been expanded several times in the last 15 years and now seats 30,000. The University of Nevada began construction of a new 108,000 square foot fitness center in June 2015. Named the E.L. Wiegand Fitness Center, it opened in February 2017. Students' use of the fitness center is included in annual tuition and fees. The fitness center has four floors and includes a gym with three basketball courts, areas for weightlifting, cardio training, fitness classes, stadium stairs and an indoor running track. The project had a $46 million cost. The University of Nevada offers a variety of options to students who choose to stay on campus. There are eight different residence halls, seven of which house primarily freshman students. Options include an all upper-class residence hall, and a living learning community building in which freshman students of similar academic interests are housed on the same floor. Since its creation in the Fall of 2008, the University of Nevada, Reno's Sustainability Committee has been gathering information on various aspects of campus sustainability and beginning the development of a plan for creating a more sustainable campus. Significant efforts are made towards recycling and keeping the campus green. Many University buses run on bio-diesel fuels. The bicycle program has seen a significant increase in the number of bicycle users. The University's Food Services has made a commitment of 1% of the meal plan revenue to go towards funding sustainable initiatives on campus. In order to reduce energy use, UNR has installed solar panels on the Joe Crowley Student Union and built its first LEED accredited building. The University of Nevada has been ranked among the nation's most sustainable colleges, receiving an overall grade of "B+" on the Sustainable Endowment Institute's College Sustainability Report Card 2010. The university is simply called Nevada for athletics purposes. Its sports teams are nicknamed the Wolf Pack (always two words). They participate in the NCAA's Division I (FBS for football) and in the Mountain West Conference. In March 2004, the Wolf Pack Men's basketball team qualified for the NCAA tournament and advanced to the Sweet Sixteen for the first time in school history. The team earned a repeat trip in 2005 and beat Texas in the first round before falling to eventual national runner-up Illinois. The team returned for 2006 as a No. 5 seed but was upset in the first round by former Big Sky Conference rival Montana. They began the 2006–07 season ranked #24. The Pack's major star during this recent period of success was Nick Fazekas. In 2007, Nevada was ranked No. 9 in men's basketball, which is the highest ranking that Nevada has ever held. Coach Mark Fox took over after Trent Johnson left in 2004 to coach at Stanford University. On April 3, 2009 it was announced that David Carter would replace Fox who decided to leave Nevada for the same position at the University of Georgia. On March 1, 2012, the Wolf Pack basketball team won against New Mexico State University for the WAC title. In 2014 the school hired former Golden State Warriors Head Coach Eric Musselmen. Under Musselmen the Pack has had massive success. In his first year they won the CBI invitational tournament. In Musselmen's 2nd season they won the Mountain West regular season and tournament title and received a #12 seed in the NCAA tournament where the Pack lost to Iowa State 74-63. In his third season (2017–18), the Pack won the Mountain West regular season and received a #7 seed in the NCAA tournament where they beat #10 Texas 87-83 in the first round. In the second round, they defeated #2 Cincinnati 75-73 after trailing by 22 points. They fell to Loyola Chicago 68-69 in the Sweet Sixteen. The football team, currently coached by Jay Norvell, plays at Mackay Stadium. The modern Mackay Stadium replaced its predecessor and was completed in 1966 with a seating capacity of 7,500. The facility has been expanded several times in its history and now seats 27,000. In 2005, Nevada won a share of the WAC Title. The 2010 season saw Nevada at its best finishing the season ranked No. 11 in the AP and No. 13 in the BCS, stunning Boise State 34-31 and costing the Broncos a possible shot at the BCS title, to win another share of the WAC Title. Annually, Nevada's football team plays its primary rival, UNLV, for the Fremont Cannon in the Battle for Nevada. Nevada currently leads the all-time series 25–17, after a 45–10 win in Las Vegas during the final game of the 2016 season. Nevada also plays UNLV twice a year in basketball, with Nevada losing the last 2 games and trailing the all-time series 59-22 overall. Nevada's two out-of-state rivals, particularly in football, are Boise State and Fresno State. In 2012, Nevada joined its rivals Boise State, Fresno State and UNLV in the Mountain West Conference. Nevada's editorially independent, weekly student newspaper is The Nevada Sagebrush. It comes out every Tuesday afternoon, and employs more than 40 people, 25 full-time. Prior to 2004, the newspaper called itself simply the Sagebrush. The newspaper won the Associated Collegiate Press Pacemaker award in 2008 and 2009. It was also a finalist for a Pacemaker at the 2006 and 2007 ACP student journalism awards. It has won the best of show award at the fall 2005, 2006 and 2007 ACP national conferences in its category (weekly broadsheet at a four-year university). It was also nominated for an online ACP Pacemaker in 2008. Its website, www.nevadasagebrush.com, which launched in the fall of 2007, has also been recognized by the Center for Innovation in College Media for it breaking news packages, podcasts, videos and general innovation and web presence. Many of The Nevada Sagebrush's former editors have gone on to work and take internships at newspapers and news organizations such as The Washington Post, The Oregonian, USA Today, The Miami Herald, The Arizona Republic and the Associated Press, as well as dozens of local newspapers around the country. Insight Magazine is the only student-run magazine at the University of Nevada. Formerly Nevada's yearbook for nearly 100 years, Insight Magazine has evolved into the second major publication circulating at the university. Its first edition was published in September 2008. It presents itself as a theme-based monthly magazine, providing photography, stories and graphics, in contrast to the weekly, newspaper-style of The Sagebrush. It is put out both in print and online. The online version, UNRINSIGHT.com, provides both support for the published stories and independent content. In its sophomore year, Insight Magazine received national attention from major college media organizations, such as the Associated College Press and the College Media Advisers. Insight placed fifth for headline presentation in Best of Collegiate Design 2009 by the "College Media Advisers". At the 2009 ACP Conference in Austin, Texas, Insight placed fifth in Best of Show for an audio podcast. ^ "Annual Enrollment Comparisons by Fall and Spring Semester". Retrieved September 26, 2018. ^ "Approved Colors". University of Nevada, Reno. Retrieved February 12, 2016. ^ Carnegie Classification. "University of Nevada". carnegieclassifications.iu.edu. Retrieved February 21, 2016. ^ "University of Nevada School of Medicine". Medicine.nevada.edu. Retrieved November 7, 2010. ^ University of Nevada, Reno. "About - Journalism". Journalism.unr.edu. Retrieved October 23, 2013. ^ "Training Session for Inkblot Employees" (PDF). pp. 18 (on page 15). Retrieved February 28, 2013. ^ "University of Nevada, Reno". U.S. News & World Report. Retrieved November 2, 2016. ^ "Part-Time MBA Programs". Bloomberg Businessweek. Retrieved November 7, 2015. ^ "Office of the President | University of Nevada, Reno". Unr.edu. April 20, 2012. Retrieved November 21, 2016. ^ "Tuition and Fees at Flagship Universities over Time - Trends in Higher Education - The College Board". Trends.collegeboard.org. Retrieved November 21, 2016. ^ Straka, Thomas (November 2009). "Ten things you didn't know about: Land-grant universities" (PDF). Nevada Silver & Blue. Retrieved August 2, 2011. ^ "UNR pleased that plans for engineering building at top of priority list". Reno Gazette–Journal. Retrieved April 22, 2016. ^ "E. L. Wiegand Fitness Center". University of Nevada, Reno. Archived from the original on September 5, 2015. Retrieved April 22, 2016. ^ "Sustainability Committee Information". University of Nevada, Reno. Archived from the original on August 3, 2009. Retrieved June 5, 2009. ^ "Campus Sustainability: Food". University of Nevada, Reno. Retrieved August 14, 2011. ^ "Campus Sustainability: Energy". University of Nevada, Reno. Retrieved August 14, 2011. ^ "Nevada Today". University of Nevada, Reno. October 7, 2009. Retrieved November 7, 2010. ^ "College Sustainability Report Card 2010". Sustainable Endowments Institute. Retrieved October 14, 2009. ^ "Fresno State, Nevada to remain in WAC until 2012". ESPN. October 28, 2010. Retrieved October 23, 2013. ^ "Nevada Sagebrush nominated for Pacemaker award". Reynolds School of Journalism. University of Nevada, Reno. Archived from the original on October 7, 2010. Retrieved August 14, 2011. 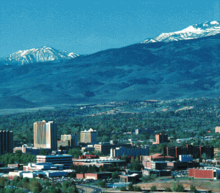 ^ "Psi Phi chapter installs at University of Nevada – Reno – Alpha Kappa Psi". Akpsi.org. Archived from the original on July 20, 2011. Retrieved November 7, 2010. ^ "Campus on the Hill: A walking tour of the University of Nevada". Delamare.unr.edu. Archived from the original on August 30, 2010. Retrieved November 7, 2010. Wikisource has the text of the 1905 New International Encyclopedia article Nevada State University. "Nevada, University of" . Collier's New Encyclopedia. 1921.